Lee Brice has a lot to celebrate at the moment. He is nominated for Best New Artist at the 46th Annual CMA Awards, his single “Hard to Love” is on the cusp of hitting No. 1, and he’s got big plans for 2013. The South Carolina-born artist has been regarded as a consummate Nashville songwriter for some time, landing award-winning monster hits for Eli Young Band (“Crazy Girl”), Garth Brooks (“More Than a Memory”), and even himself (“Love Like Crazy”). So it’s interesting to note that he had no hand in writing his No. 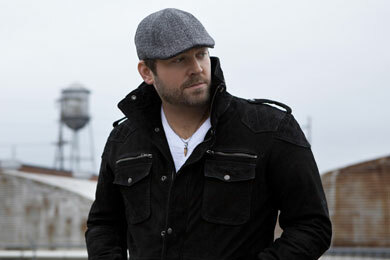 1 hit “A Woman Like You” or “Hard to Love,” both of which appear on his Curb Records sophomore album Hard 2 Love. That’s okay, Brice says, because what matters most is that he identifies with the material. “Hard to Love” has its origin in a writers retreat Brice took with friends. Brice and two of his buddies were writing outside, and three others (Billy Montana, John Ozier, Ben Glover) were inside doing the same. When Brice came in for a snack, he heard the group working through the song. It has been a gradual evolution for Brice, from hit tunesmith to hit artist. While he wants people to remember his songwriting contributions, his goal since arriving in Nashville has been the less-traveled road of artist singer/songwriter. 2012 has been all about moving forward for Brice. “A Woman Like You” hit No. 1, then went on to Gold and Platinum sales designations; Brice toured nonstop, playing shows with Luke Bryan, Miranda Lambert and more; and he just recently returned from the Blake Shelton cruise. With the busy touring schedule Brice keeps, it only makes sense that he occasionally drops some of his hits for others into the mix at his shows. “More Than a Memory” pops up on occasion, but a newer hit really gets the crowds going. Brice recently had a unique opportunity to put his writing talents to the test. A longtime fan and former player for Clemson University’s football team, Brice was selected by the school to create a game day fight song for the Tigers as they take the field. The result was “Orange Empire,” an AC/DC-esque crunchy rock anthem that will play in the stadium at home games. Brice will get to experience it for himself during Rivalry Weekend, when he hosts a pre-game concert Nov. 23 at Littlejohn Coliseum. The following day, the Clemson Tigers will take on the University of South Carolina Gamecocks. Before that happens, Brice will experience a whirlwind CMA Awards week. He’s scheduled to perform at the SESAC Awards Oct. 28, and he will be accompanied by his fiancee Sara to the CMA Awards Nov. 1 to see if he wins the Best New Artist honor. Somewhere in between, he will find time to go trick-or-treating with his son Takoda on Halloween. It is a tricky process to balance family and work, but Brice says he is figuring it out. Once the CMA Awards are over, Brice will focus his attention on 2013. He has plans to begin recording his third album (which he says could be titled “I Don’t Dance”) in January, and will embark on a tour with an unspecified male artist. After that, he’s setting a course for the moon. Above all, Brice is grateful for everything that has happened in the last year. The hit songs are happening, fans are coming to shows, and he’s got a loving family waiting for him at home.